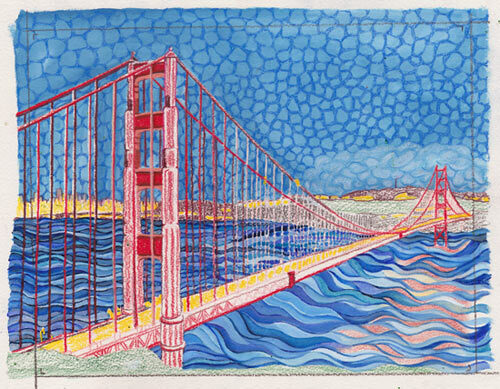 I’m working on a Golden Gate Bridge piece again. The underpainting is all blocked out, including patterns in the sky and water. I’ve played with these patterns before but never in a strategic way. And I've figured out where the 8x10 matte will cut off the image so I think through its borders. I’ve attempted this image many times over the years, and so far, I only like this one from 2013 a little and maybe this bigass one for sheer size and moxie. But each time, the image gets better. I can see what to/not do with this one. Already, I like how I’ve blocked out the sky circles and water waves. Now I’m going to experiment with colored pencil for the bridge and really get its structure locked in before using paint. Here’s Stage 1 from July (yep, bit of a time lapse) and my source photograph.